• A local savings group raised £15,000 for munitions in the war effort. • Gravesend members of the Fruit Allocation Committee complained at Gravesend’s lack of fresh fruit and vegetables. • Morrison table shelters were in great demand. • Miss Eva May Wong gave a special performance of her act at a dance at the Co-operative Hall, Gravesend in February. • The Gravesend Reporter was rationed and its price increased from 2d. to 3d. • A local man was sentenced to 12 months hard labour for stealing bicycles. • Two emergency food vans were presented to Gravesend Council by the Ford Emergency Food Van Trust. • Councillor Mrs C.R. Lane was elected the first woman chairman of Northfleet Council. • Evacuated pupils of the County School for Boys returned to Gravesend in August. • All iron railings and gates were removed from the Borough for the War Effort. • Gravesend Airfield was at it’s most active in August as the combined offensive against Dieppe took place. • All men between the ages of 18 and 60 and women between 20 and 45 were required to register for fire prevention duties. • The Borough of Gravesend collected £27,720 to buy three tanks for the War Effort. • A fire at Cobham Hall was confined to one wing of the building thanks to firemen, estate employees and others. The power plant building was practically destroyed and the clock tower was damaged. • At the Majestic Cinema, Gravesend, amateur players presented a new civic flag to the Mayor ready to be flown on Victory Day. • Signposts were put up again in March after being taken down in 1940. • Ceremony was held to mark the adoption of HMS Cygnet by Northfleet. • Gravesend and Northfleet aimed to raise £250,000 for “Wings for Victory” week - £354,061 was raised. • A burst barrage balloon covered three houses in Wingfield Road. • The Borough of Gravesend adopted HMS “Chanticleer”. • Plans were put forward to build a land plane/flying boat airport a few miles east of Gravesend. • A Thunderbolt aeroplane landed on the golf links. • Park Avenue, Northfleet was damaged in December by a bomb. Cobham - land plots near Cobhambury Road and Jeskyns Road were earmarked for house. Higham - Four housing sites suggested, but further meetings were needed to finalise plans. Luddesdowne - New houses were to be built near the old rectory. Meopham - Sole-Street/Meopham area to be considered for housing expansion. Shorne - Swillers Lane which was to be used for council housing. • Jubilee Crescent damaged by a bomb. • De Havilland Mosquitos arrived at Gravesend Airport in April. Australian and New Zealand squadrons moved in with these to prepare for the invasion of France. • The Gravesend and Northfleet “Salute the Soldier” week got off to a good start with the announcement that £125,000 was already promised towards the £300,000 target. The final figure was £359,577. Cobham raised £8504, their target being £3000 and Shorne exceeded their target of £4000. • The first V1 to be launched against Britain fell on Gravesend at 4.18am.on the 12th June. • Gravesend Airport’s operational life came to an end due to the V1 rocket attacks. Flying operation became too hazardous. • V2 attack began on Britain in September. Gravesend received two hits in heavily populated areas causing considerable damage and some casualties. The first rocket landed near Echo Square demolishing houses and killing four people. The second V2 exploded in Milton Place in November, just outside the Fort Gardens. Unlike Echo Square this happened at night and a local bandleader and his girlfriend were killed. • Gravesend and District Victory fund reached £6035. • Lord Kindersley, President of the National Savings Movement, presented Northfleet and Gravesend with plaques to commemorate the successful efforts of both towns to invest in local savings schemes. • A celebration was held to mark the centenary of the railway line from Gravesend to Strood. • The Victoria Cross was awarded in March to Acting Squadron Leader Robert Palmer who had been shot down over Germany. Robert Palmer had lived and worked in Gravesend before joining the RAF. • Gravesend inhabitants celebrated V.E. Day (Victory in Europe) in May, with bonfires and torchlight processions. • Higham Parish Council decided to erect a village hall in honour of all local men killed in the war. 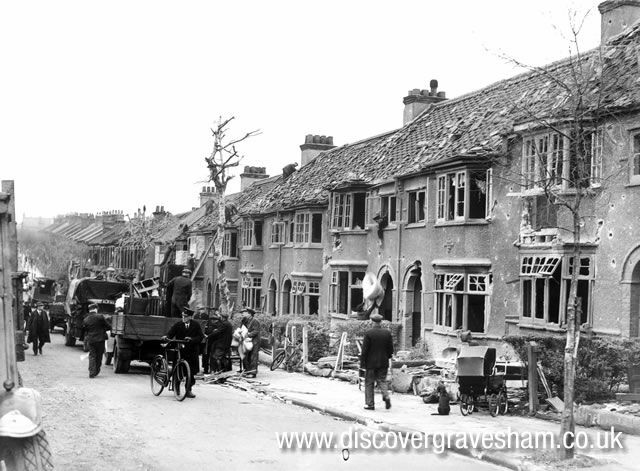 • The following information was issued concerning war damage in Gravesend - 97 houses totally destroyed, 207 houses badly damaged but repairable and 7159 house receiving first aid repairs. • German prisoners of war started work at Lorton Road preparing the council’s first post-war site on which 118 pre-fabricated houses were to be built. • Gravesend and District Victory Fund raised the £10,000 needed to clear pre-war debt on the Gravesend and North Kent Hospital. • The Bishop of Rochester consecrated the extension of the burial ground at Gravesend Cemetery in September. • There was an acute shortage of soap in Gravesend. • Gravesend and District Victory Fund set a target of £5000 to provide a chapel at the Gravesend and North Kent Hospital. • For the first time a lady was chosen as Mayor elect - Councillor Edith Cole J.P.
• Three men were killed on the tug “Empire Stella” when the boiler exploded. Two of the crew were Gravesend men and one was from Northfleet. The accident occurred in the Thames Estuary. • Strood Rural District Council planned a comprehensive sewerage system for the parishes of Higham, Shorne and Frindsbury Extra at an estimated cost of £103,500. • Work commenced on the housing estate at Westcourt, Chalk. This was the first post-war development on the site and was opened by the Mayor in November. • Sir Herbert Baker, the eminent architect who reconstructed the Bank of England, died aged 83. He was born in Cobham and lived at “Owletts”. He gave “Owletts” to the National Trust in 1937 as well as Yeomans, a 15th Century half-timbered building in Sole-Street. • The decision was taken to form a new limited liability company and football team known as “Gravesend and Northfleet United” which combined the teams of Gravesend United F.C. and Northfleet United F.C. Northfleets ground was leased for 5 years and the new club had £2500 as share capital. Mr Andy Wilson, holder of 14 international caps and former captain of Scotland, was appointed the new manager. • Tenants moved into pre-fabs in Orchard Road, Northfleet in March. • A life-like oil painting of Lance Corporal Eric Harden, was unveiled in the Northfleet Urban District Council Chamber in May. Born in Northfleet he was awarded the VC posthumously in March 1945 for his bravery in rescuing 3 wounded men, while under fire. He was killed as he returned for the third wounded soldier, who was then saved by other members of the rescue party. • There was a Victory Day celebration procession through Gravesend. • Gravesend Borough Council acquired 9781 acres of land in Chalk Parish in order to construct a major housing development in the Bourne Road/Barr Road area. • The canteen of the Y.M.C.A., used by the Forces in Gravesend closed after 5 years and 4 months. An estimated 1,086,000 meals had been served during its existence. • Higham Vicarage was put up for auction. • A shortage of bricklayers was hindering the progress of the Perry Street Estate in Northfleet according to reports made to Northfleet Urban District Council in October. • A squatters’ camp at Harvel was a constant topic of discussion at Meopham Parish Council and Strood Rural District Council meetings over health and rehousing problems. • 2,000 acres of agricultural land, part of Cobham Park was purchased for £100,000 by Rochester Corporation from the Earl of Darnley. • Eden Place, Gravesend was earmarked for demolition by Gravesend Borough Council. • First street lamp in Church Lane, Chalk was erected by Gravesend Borough Council in February. • The Wrotham Camp Site at Meopham was renamed “Vigo Village”. The provision of a school for the children of the village was proposed, as the distance to travel to other schools in the area was too far. The Church Army community centre was opened by the Bishop of Rochester in November. • Cooperative Society to Chalk Church as a Church and youth centre. • A service for German P.O.W.’s was held at Chalk Church. Hymns were sung in German and English. The sermon was preached in German by Padre Herr Roeder while Chalk’s Vicar, the Rev. A.W.W. Bowman translated it into English. • Neighbours and German P.O.W.’s helped to fight a fire in a 15th century cottage at Harvel. Antiques and furniture were rescued while the fire was restricted to the top storey. • An unexploded bomb was found in Albion Terrace, Gravesend and defused. • A huge electricity power station for North Kent was projected on a site in Northfleet between Henley’s and Bowater Paper Mills along the riverfront. • Northfleet Urban District Council introduced their novel scheme of placing islands of rose beds and flower gardens in their New House Farm housing estate. • The east window of Milton Chantry was uncovered by the demolition of a 400 year old brick built annexe. • A great fire destroyed much of T.B. Maclean’s Dairy in Rochester Road, Denton. Several prize bulls perished in the blaze. Another fire a few weeks later killed eight cows. • Radar was installed on the Gravesend-Tilbury Ferry. • National Coal Board gave permission for a mine to be sunk at Cobham, after the first traces of coal were discovered at Scalers Hill the previous year. (The Cobham (Kent) Mining Co. was wound up and the mine closed in 1953). • First religious broadcast from Gravesend was transmitted from St. George’s Church. The service was broadcast on the B.B.C.’s worldwide programme “Sunday Half Hour”. • Northfleet Urban District Council showed concern over the slow progress of the housing estate at Perry Street. The contractors had still to complete their task two years after starting. • The belfry of St. Andrews Waterside Mission Church was declared unsafe and was to be demolished. • Mr F.S. Gould, photographer and the creator of the Gould Collection of glass plate negatives covering the Gravesend area during the late nineteenth and early twentieth centuries, died. This collection is held at the Gravesend Library, Windmill Street. • Kent County Council Education Committee purchased Wombwell Hall, Northfleet.